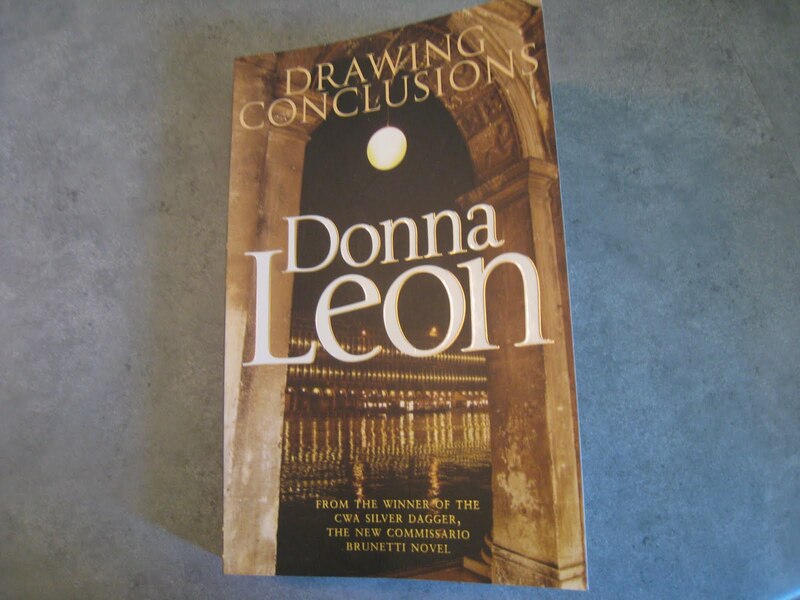 The Little House of Concrete Bookshelves: Donna Leon "Drawing Conclusions"
I spent much of the morning walk the day after I finished Drawing Conclusions musing on my reading habits. Actually, that's not quite right. I started off trying to figure a lead-in to a review of this latest title from Donna Leon, and those musings lead fairly directly towards a consideration of why I like what I like and why this was another highly enjoyable read. Looking at these matters, it's fairly obvious that if I'm going to add an author or a series to the list of things to chase down it'll be because I like the characters and the setting rather than intricacies of plot line, action and suspense, which I tend to take for granted. 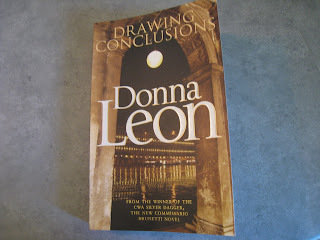 Donna Leon's Commisario Brunetti works as a character, and given the Venetian setting and the fact that Italians tend to eat and drink well the series is a fairly obvious candidate for the Little House of Concrete Bookshelves. It has the additional advantage of not necessarily being a series that needs to be read in order, which means I can grab the missing titles and read (or re-read) them as I find them. There's also the undeniable fact that the subset of crime fiction usually labelled police procedural has a couple of fairly obvious attractions for the aspiring author. Any police station and its surrounding support and ancilliary services offers an almost ideal environment in which to create those intricate plot lines we've come to love. After all, the hierarchy of any police force is going to feature any number of prickly characters, ambitious individuals and obnoxious prigs, and your main character's interaction with them is always going to give you something to work with. At the start of Drawing Conclusions, Brunetti is undergoing the ordeal of a dinner with Vice Questore Patta and Lieutenant Scarpa when an incoming call on his mobile gives him the excuse to get away from Scarpa's unfavourable assessment of the oenological practices of the Veneto region. It's one of those occasions that you'd prefer to avoid at all costs, but there are things that can't be evaded, and Brunetti has been known to use calls from his wife as a pretext for escaping such events. It's not, however, Paola on the other end of the notional line. The body of Costanza Altavilla, a retired female teacher has been found by her upstairs neighbour, who has just returned from a disappointing holiday in Sicily and went looking for her mail, which the neighbour had been looking after. In a situation where any excuse will do, Brunetti heads off to check what has all the appearances of death due to heart attack, though there are signs that could be consistent with some degree of violence - an obvious wound on the head and what could well be bruising near the collarbone — or could stem from falling onto the nearby radiator. With the coroner's verdict favouring the heart attack theory, you'd expect that would be it, but there are things that intrigue Brunetti enough to poke around a bit further on the grounds that something may have created conditions that led to her heart attack. Meetings with the woman’s son, called to identify the body, the upstairs neighbour, and the nun in charge of the nursing home where she worked as a volunteer leave Brunetti's suspicions undiminished. The son seems distracted by something, the neighbour witnessed something suspicious, and the nun, initially reluctant to reveal anything eventually describes the deceased’s terrible honesty. There's still, of course, nothing to base a formal investigation around, but Brunetti continues digging away, aided by his offsider Vianello and Signorina Elettra, whose ability to infiltrate supposedly secure websites and similar sources of information proves, as usual, invaluable while simultaneously raising various ethical and moral issues. The first aspect to be clarified involves the discovery of changes of clothes in various sizes in the deceased's apartment and discussions with the Signorina Elettra suggest Altavilla was helping abused women escape their abusers. Well, there's a motive, for a start, and while the disappearance of her most recent guest seems to offer an explanation, but closer examination reveals a reality that differs from what appears on the surface. With that avenue of investigation seemingly closed, Brunetti turns his attention to the nursing home, where Signora Altavilla volunteered, in search of an explanation for the heart attack. She was, he learns, someone willing to listen to stories told by people who have little left but their own memories, and in such circumstances she became the sort of confessor who hears things people would keep concealed from members of their own families. That proves to be the secret here, though in the end it's not the sort of case where Brunetti's likely to press charges. These things play out against the familiar Venetian backdrop, with Leon drawing on whichever of the familiar elements fit into the developing narrative. There's only marginal room for Brunetti's aristocratic in-laws, though the family connection turns out to be a key factor in solving the puzzle. Brunetti misses his lunch on occasion, something the average reader wouldn't be doing if the dishes Paola prepares were visiting a kitchen near you, and the mealtime interactions with the family provide a stark contrast to the lunchtime scenes at the nursing home. Against that backdrop there's plenty to muse on as far as the state of Italian society is concerned. Signorina Elettra's electronic snooping isn't exactly ethical, but one suspects that if she wasn't doing it cases wouldn't end up being solved. Buying flowers for the office and getting the Questra to pay by substituting a receipt for printer cartridges would be sailing pretty close to the anti-corruption wind in other jurisdictions but here, one suspects, if the substitution didn't occur the flowers wouldn't end up in the office. There's nothing startlingly new in the twentieth tome in the series, but there's a niche-market familiarity that ensures that Leon fans will continue to track down successive Brunetti stories as they appear in the marketplace.